The AWEX EMI added 28c to close on 1550c at auction sales in Australia this week. The 38,217 bale offering was met with strong buyer competition which was supported in the 96.4% clearance for the week. The Merino MPG’s all posted solid rises ranging between 15c and 62c with the hottest market in the 19-20 MPG’s. The 28c increase was added in equal instalments over the two day sale which augers well for next week’s 39,716 bale offering. Skirtings added 20-50c rises with the lower VM lots commanding the buyers’ utmost attention, cardings continued their bullish run adding 21c in Sydney and Fremantle with Melbourne adding just 7c. Crossbreds are the only sector to tell a negative story with losses of 10-24c experienced as the offering grows. The attention now turns to quantity of wool on offer after the YOY quantities are 10% ahead of last year. 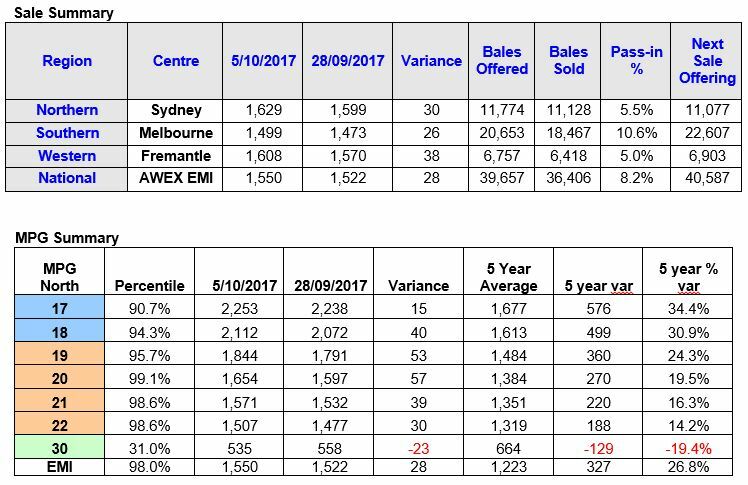 After week 14, Australia has sold 438,663 bales – 8.3% more than the same time last year. Whilst we would like to think production was up, the rise would possibly be due to the extended periods without rain over the past three months. In the same period, the value of wool sold has increased by $151.5m up 24% and the average $/bale sold has moved up $227/bale up 15%. On the forward markets, Michael Avery from Southern Aurora Wool reports a strong week for both the auction and forward markets. Fine wools prices at auction remain below their May highs but record forwards levels were set in 18.5 and 19.0 microns. 18.5 microns traded at 1950 for November and 1940 in February. 19.0 traded at February at 1800 and April 1790. Strong forward levels were achieved also in 21.0 microns trading at 1560 in November through to 1520 in February and May/June at 1500. Volumes were only light with growers taking the few opportunities on offer. Forward prices into the autumn next year represent a hedging return per bale of $2,200 for 19.0 microns and $1,900 for 21.0 micron.